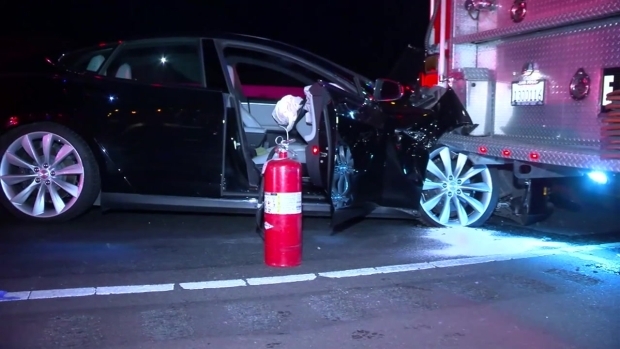 A man was arrested after crashing his Tesla into a firetruck early Saturday morning, telling police he thought he turned on the vehicle's Autopilot function, according to the California Highway Patrol. The Tesla driver, 37-year-old Michael Tran of Monterey, was arrested on suspicion of driving under the influence of alcohol after he crashed into a San Jose Fire Department vehicle on Highway 101 north of Coyote Creek Golf Drive, said CHP Sgt. Shawn Sinclair. 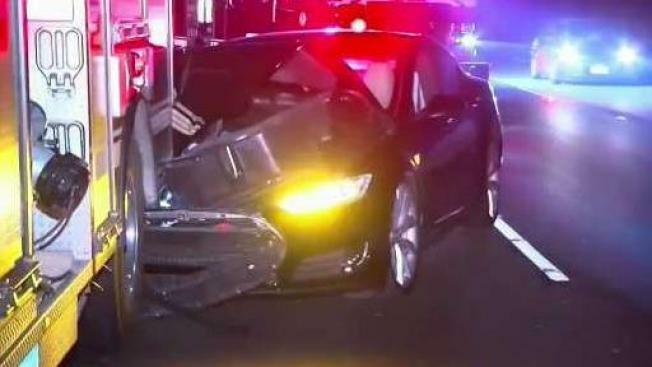 A man was arrested after crashing his Tesla into a firetruck early Saturday morning, and telling police that he thought he turned on the vehicle's autopilot function, according to Gilroy California Highway Patrol. Tran told officers: "I think I had auto-pilot on," but it was unclear whether the Tesla was in self-driving mode when it crashed into the firetruck. The collision sent Tran and his passenger, 26-year-old Yorleyda Londono of Monterey, to San Jose Regional Medical Center with minor injuries. Tran was later booked into Santa Clara County Jail. San Jose fire Capt. Mitch Matlow says his crew is lucky to be alive as the fire engine served as a barrier. "It had all of its lights on; it was doing its job," he said. "It was properly positioned, and it saved the firefighter." Matlow added that the fire crew saw the crahs and immediately went into response mode to help the Tesla occupants. Tesla released a statement Sunday, saying in part: "Tesla has not yet received any data from the car, but we are working to establish the facts of the incident." The crash caused a temporary closure of the fourth lane on 101 but it didn't affect traffic, CHP officials said.